Park Town is an awesome match 3 puzzle game developed by RED BRIX WALL. Solve match 3 puzzles to save the park from destruction and fill it with lovely animals from across the globe. Your friends can also help you with your mission, exchange lives and other useful bonuses with them. You will also find contests, competitions, and daily gifts in the game. Change the entourage according to your taste by using different kinds of decorations. Meet the city inhabitants, who are always ready to help you. There are a wide selection of decorations that allow you to spruce up the park according to your tastes. 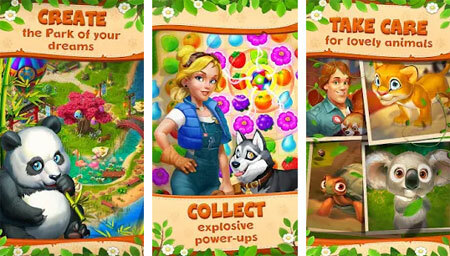 The game features exciting match 3 levels with explosive bonus combos. Enjoy a vast park territory housing a tiny scorching Africa, frosty icebergs, and fun attractions. Meet cute animals, each with their own unique story. If you get stuck in the game, check out the video walkthrough and gameplay for the game. This entry was posted in Android and tagged Park Town Cheats, Park Town Gameplay, Park Town Guide, Park Town Walkthrough by Marvin Tang. Bookmark the permalink.